Ok, it's 2014 and the AFC Challenge Cup is about to start. Sure I've been gone but that doesn't mean Azkal madness has deserted me! Keep checking here I'll be back with more stuff soon! And go Simone Rota!! As preparation for my "Armchair Generalship" for the UAE match I watched a few games, among them the 2012 match vs Bahrain, Kuwait, the DPRK(North Korea) then ending with both games of our PFPC 2013 match(to see our teams new tendecies, strengths and weakness. In this write up I"ll be focusing more on the game versus, Kuwait and Bahrain for the simple reason that they are a similar middle eastern team with a high ranking differential with us and, against DPRK because in recent years they ARE the highest ranking team we've ever played. Prior to the game against Bahrain and Kuwait, an interview was taken by an Azkal defender and said in a nutshell that; they will NOT play very defensive as they want to know where they stand in the game itself and if we bunch this statement up with Weiss' oft stated wish to turn the Azkals into an offensive machine it is perhaps no surprise that taken as a whole the team did just that. For better or worse no more "parking the bus" for these Hans Michael Weiss led Azkals. Below are the initial starting lineups. The only differences are some starters were not included either because of injury, fitness issues due to a previous injury or in the case of the Younghusbands in the middle east tour, disciplinary in nature. 1) DPRK FIFA rank at 111 and Philippines at 157. 2) Defensive captain Rob Gier was coming off an injury and did not play. 3) Highest ranked team we have played in the "Azkals" era. The first game of our 2012 CC campaign, the Azkals decided on a standard 4-4-2 type formation. We lost against the DPRK which played a possession type and efficient short passing game which we could not break down although we had some good chances at goal early in the match. 1) Bahrain was then at 115 while the Philippines was at a historical high of 147. 2) First time Gier and Juani has started together at CB. 3) Both Younghusbands did not start because of the now 'infamous' affair concerning the brothers commercial endorsement vs country... problem. 4) Read my game recap ( here ). A listless Bahraini side was punished by the hard working Azkals who were rewarded by an unforseen but deserved draw. We employed 5 midfielders in the game which eventually throttled any Bahraini attack. A defensive type formation used very well by Weiss and his team not to mention yeoman work by our veteran defenders. An unmistakeable victory(although a draw) by a weaker team with a proper game plan. 1) Kuwait was then at 112 and the Philippines was at 147 in the FIFA ranking. 2) Both Younghusbands did not start because of the now 'infamous' affair concerning the brothers commercial endorsement vs country... problem. 3) Phil Younghusband came in the second half and the Philippines had two good forwards that provided a livelier attack. Against Kuwait in 2012 we had a formation theat was between a 4-4-2 and a 4-5-1. As you can see we had the midfield flooded with 5 midfielders and only one forward. To be fair Paul Mulders was supposed to be a "withdrawn striker" such as his role during the Azkals great victories in the Challenge Cup of 2012 but few will actually mistake him as such as he isn't a reliable goal scorer. His forte' is passing, roaming the midfield and defending. A cautious or one may say 'defensive' formation. Azkal starting IX: *GK for this match was Neil Etheridge! Not a full strength Kuwaiti side yet still very good. We played a rather defensive formation and was more dangerous with the entrance of Phil Younghusband in the second half. With two good strikers we had some very clear chances but the quality of the opponent was enough for them to gain a win. While it's impossible for one to know what the UAE team will do in preparation and what 'on pitch' tactics they will use, being such a highly ranked team against us(71st vs 137th) it is quite possible that the UAE team will NOT be using most or all of their regular/best personnel but rather on their younger players, substitutes or fringe players. We've done this to before, for example in the 2012 edition of the PFPC I tournament when some young and new players were "capped" by the team, regular subs were given starring roles and struggling veterans were given pitch time to regain their previous production. Against UAE we will not have the services of the great Stephan Schrock yet we will have the services of the newly agressive Chris Greatwich and the very quickly improving Patrick Reichelt who's shown that he is a very capable forward/striker when he is needed to be. This is a wonderful challenge for the Azkals. As much as I really don't think we will emerge victorious against UAE, we can still LEARN from them even in defeat. Since we know Weiss is itching for offense rather than to just sit on defense we can be sure he'll try to sneak in a counter attack when he's given the chance. But lets not discount the role of a suffocating defense, if you have, then look back at our forehead slapping loss against the clearly outmanned but not outplayed Chinese Taipei team in the just concluded PFPC II. In line with Weiss' usual tendencies I can imagine he will not go defensive but will try to impose his gameplan on UAE for better or worse. When or if the Azkals seem unable to compete with the opponent then I believe he'll be forced to make changes in formation and personnel. I think in the first 10-15 minutes(much like it was against the DPRK, Bahrain and Kuwait) there will be 'feeling-out' process. If it looks like we can manage the UAE teams attacks, I think we continue with this formation, generally. 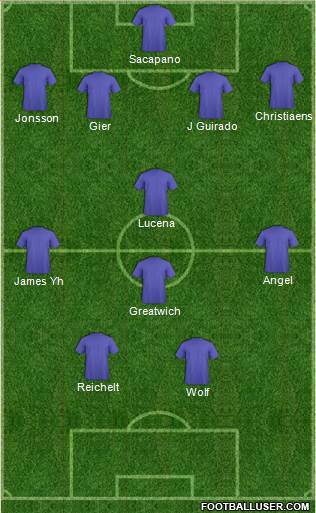 If not then Reichelt will probably drop down deeper within the midfield group. Although Phil Yh is a very good passer and would be better off as the secondary striker his defense, or lack off will dictate he remain up front. 1) Reichelts play has improved drastically ever since he started playing in Thailand that being said, he is the key up front to provide offense AND defense as he is active in both spheres unlike Phil whose main focus is offense. 2) A compact defense that includes Jerry Lucena at DM. This defense must stay compact and disciplined at all times. The defensive wingers will need to be cognisant of the fact that they must not get caught up in a UAE counter attack, out of position. 3) Greatwich must play like a poor mans Schrock. He must stay aggressive and must remain involved with the ball movement. One touching every pass will not help his team. 4) It's a friendly, I expect Weiss to use most or the maximum allowable substitutes to keep legs fresh during the game. After his debut in 2011 and because of fan uproar, Weiss has recognized that while it's great to have 90 min players, using his substitutes can be another weapon in his arsenal too. 5) The center mid and defensive mid will be quite busy, it's probably a good idea to put in de Jong later in the game to replace Lucena. Young and aggressive, de Jong has been sidelined by Weiss too long. 6) Ed Sacapano will be sorely tested in this game, he has never been better than when his mindset is calm and collected similar to when he was being coached by Coach Z last year. One would hope he is in that state of mind now. 7) If we are losing lets keep the points differential to 2 or less. Considering that the FIFA rank separation is +60 points, being able to limit UAE's offensive output to two or less and also scoring against them can be considered a minor victory in itself. Sorry I had a typo on the last "formation" versus UAE. It should have been PHIL on top not WOLF. Thats what I get for cut and pasting. Sorry . Philippines should be proud of team Azkals because they bring and represents the country even though there are times that they don't win. They inspires a lot of children in the street to follow their steps. How much is an Azkal worth? DENIS WOLF arrives in Manila on Monday to train with the Azkals ! Bolton Wanderers player want to be an Azkal!! So how good is Luke Woodland on the pitch? Alfredo Fernando Razón Gonzalez: A man before his time! Juan Luis Guirado: the next defensive gem? Joshua Lazaro's move from San Beda to Ateneo. Happy New Year, Happy New Blog Post!